☀ Lightweight and portable, the shear can be used with one hand. ☀ Non-skid rubber cushion on the handle prevents it slipping out of your hand in use. ☀ The pulley design and spring mechanism help to relieve wrist strain for long time pruning work. ☀ Safety lock allows an easy on-off, detachable design enables you to clear the residue thoroughly. The safety lock maybe a little tight, But it is for preventing it from dropping accidentally with the blade opening. 1. Please be careful for the sharp blade in use. 2. Please put it in a safe place where children can't reach. 3. SK5 blade is not anti-rust, better keep it dry and clean, then apply the oiled cloth on it. 4. Maximum cutting capacity: 3/4 inch diameter. It suits to cut small and medium size tree branches, not for very soft ones. 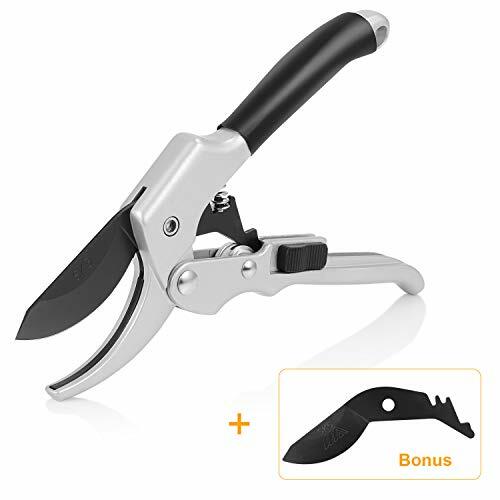 Reliable Material: Applied by import high carbon steel SK-5 blade and coated Teflon non-stick layer, the shear is extremely sharp to cut tree branches quickly while prevents the dust sticking on. Effortless Cutting: The smooth pulley and spring mechanism system saves your efforts to cut tree branches down, makes your trimming work more easily and enjoy the garden work. Risk-Free Purchase: Our 100% customer satisfaction guarantee means we will fix any problems quickly and to your 100% satisfaction every time! We are always available to help our customers!